1. 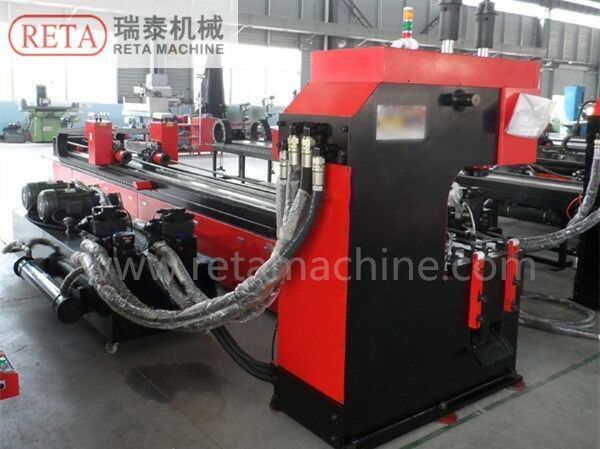 RETA Machine Hole Punching Machine can punch Circle Square, rectangular and oval on rectangular pipes and various shapes of Holes. 9.Processing settings categories: Single-Punch, non-equidistant punching equidistant. 10.TFT human-machine interface, Taiwan Tada Units control system,tough-screen settings, in both Chinese and English exchange. 11. Can be store 0-99 group processing mode. -- TFT Human-machine interface display, tough screen setting, the Numerical Control system, and precise positioning servo motor, Size of memory function in storage module. --Structure: By powerful composite combination, the frame of thick durable components. --Operating Function: Jogging / Automatic Functions two working lines can be worked separately or simultaneously. --Oil Hydraulic System: Step-less operation adjustment, hydraulic loops designed with zero load , combined with extremely low frequency oil pump motor, effectively reduced noise, increased motor efficiency and service duration. --Whenever the oil cylinder is moving downward, the machine is designed with hydraulic difference driving loops rated at high or low RPM, It is also featured with high speed downward moving, low speed processing and hi-speed position resume. It is available to increase the information stability of work pieces during puncturing. In addition to increasing the activation speed, it can effectively reduce HP lead to save electrical energy. (Stroke available for positioning) the mold set is designed with 600mm in depth available for forward and backward 150mm moving accessibility. Our machine is designed with Italy-Made digital scale ( LCD display) with high precision. --Our machine is adopted with Japan-made servo motor driving devices and the feed-in and receiving speed can be set to high speed and high precision to enhance the productivity. --It is featured with sufficient clamping force of clamping oil cylinders and the position of work pieces is stable and uneasily loose off. Automatic Feeding: One worker start the double line at the same time, if the tubes with standard size, the worker operated without any mistake, it only need about one minute punch one pipe. Artificial feeding: Two workers operate one line separated, if the tubes with standard size. the worker operated without any mistake. It need about five minutes can punch one pipe.